Separate the modules to shoulder-width to keep wrists straight. Standard 20″ link cable accommodates all body types. Tenting accessories enable 5, 10, and 15 degree to reduce forearm pronation caused by flat keyboards. 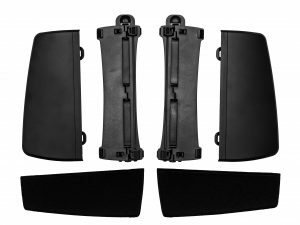 Zero-degree slope and available palm supports and cushioned palm pads eliminate wrist extension. 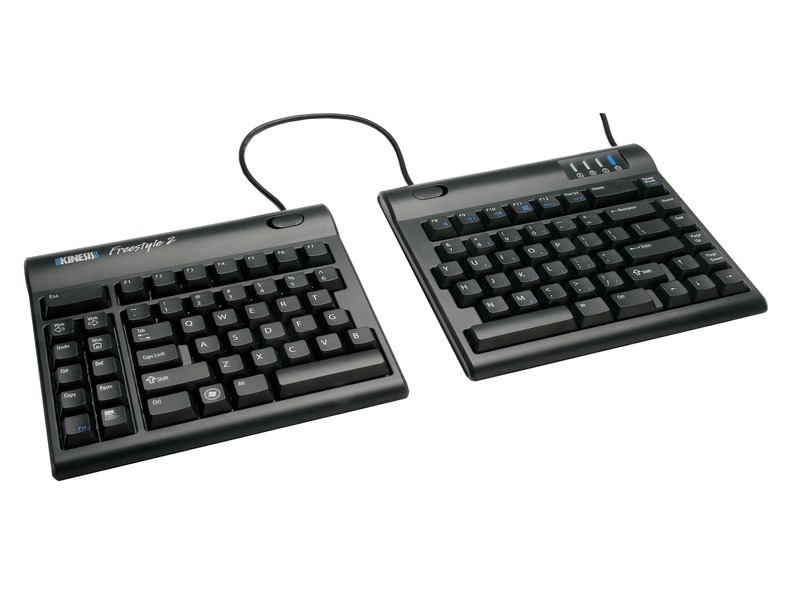 Tenkeyless layout with embedded keypad results in a smaller footprint for closer mouse placement. Which switch is right for me? 9 fully customizable dual-layer layouts for different applications, operating systems, or users. Every key can be remapped. Heavy-duty on-the-fly macros with adjustable delays, 9 playback speeds, and up to 300 characters long. Install the latest firmware to increase macro capacity to 100 macros per layout. 9 customizable layouts. One-touch remaps (unlimited). On-the-fly macros. 4MB onboard memory. SmartSet Programming App for Windows & Mac pre-loaded. Which color key switch is right for me? 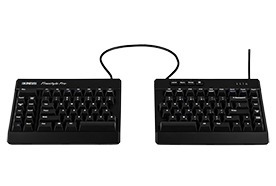 If you have never used a mechanical keyboard before you will likely find that the typing feel of the Brown and Red switches are very similar. Both switches have a low activation force and great typing feel. The Quiet Reds are ideal for an office environment because they have built-in sound-dampeners which eliminate most of the noise typically associated with mechanical key switches. 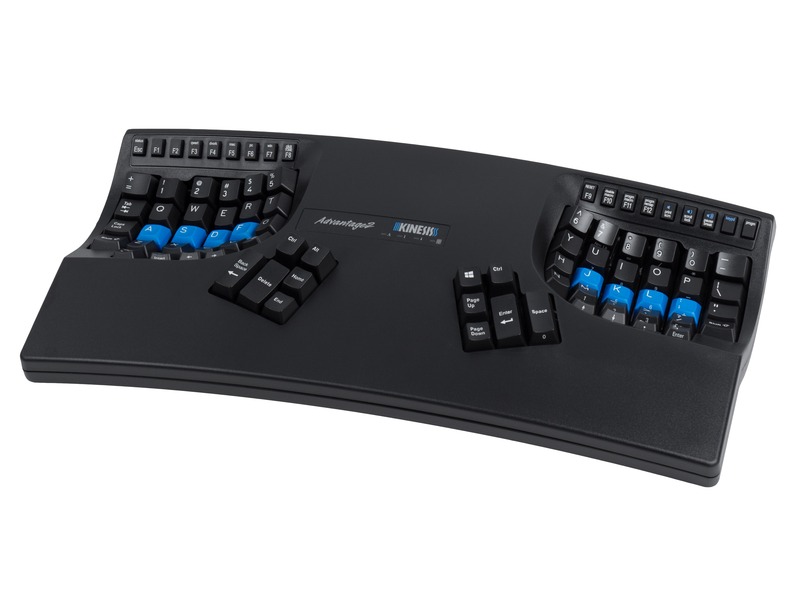 Unlike conventional one-piece keyboards and fixed-split keyboards, the user can separate or “splay” the key modules in a way that eliminates harmful bending of the wrists for their particular body type and typing posture. The split design and standard 20″ linking cable can accommodate a wide range of body types, from petite to large framed individuals. 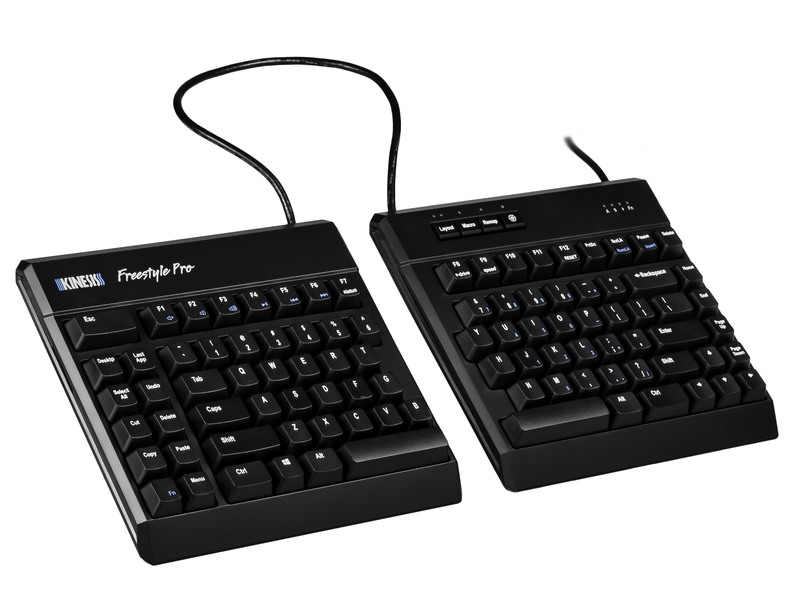 The Freestyle Pro features a conventional layout so the adaptation period is very minimal for touch-typists.  We recommend starting with the key modules close together and the lowest tenting setting, and then working your way “out and up” until you find the optimal configuration for your body. And remember, every key on the Freestyle Pro is programmable so feel free to move keys around to suit your workflow. 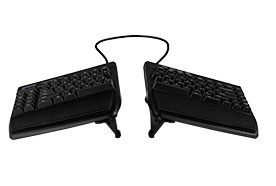 There are two tenting accessories for the Freestyle Pro keyboard. The VIP3 and V3 Pro kits both support tenting at 5˚, 10˚ and 15˚. 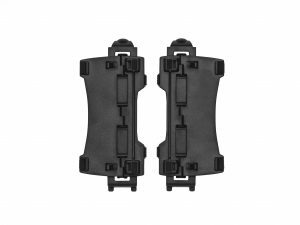 Choose the VIP3 Pro Kit for the included palm supports and cushioned pads, or the V3 Pro Kit kit for tenting without (not compatible with) palm supports. The use of palm supports is a personal preference but the VIP3 Pro kit is more popular with Freestyle Pro users. Will my Freestyle2 accessories fit the Pro? 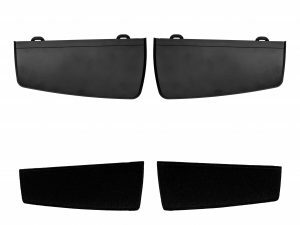 Freestyle 2 accessories look and work the same as those for the Freestyle Pro, but unfortunately they will not fit your Freestyle Pro. Due to the addition of mechanical switches, it was necessary to modify the mounting points for all of the tenting accessories. Pro users will need to purchase Pro-specific accessories such as the VIP3 Pro Tenting Kit (AC920), the V3 Pro Tenting Kit (AC930), and the Pro Palm Supports (AC906). 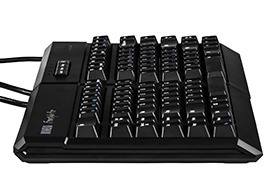 Why aren't the accessories included with the keyboard? Like the Freestyle2 before it, the Freestyle Pro is designed to be a fully modular solution for any individual. That means the user can pick and chose the accessories and configuration that works best for them, and not be stuck paying for parts they don’t need. How do I record a macro? 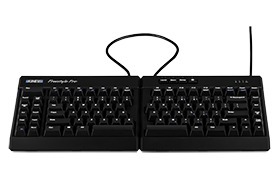 The Freestyle Pro is the most powerful macro keyboard on the market. Thanks to our SmartSet Engine, creating and playing macros is incredibly intuitive.You can record macros onboard using the dedicated macro key or launch the SmartSet to create a new macro or customize an existing one. To record a macro on-the-fly, simply tap the dedicated Macro key to enter Macro Programming Mode. On the Freestyle Pro, any one of the 95 keys can be used to trigger a macro. You can overwrite any of the pre-programmed hotkeys on the left side or assign the macro to another unused key. If you don’t have any used keys then you can assign a macro to a 2-key combination using any modifier key (Shift, Alt, Control, Windows, Command etc) in conjuction with any non-modifier key. Once you’ve selected your macro trigger, then simply type the macro contents on the keyboard. 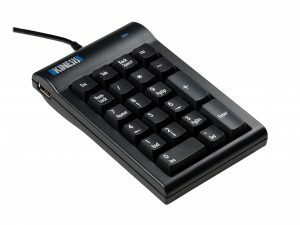 Each macro can record up to 300 keystrokes. When you are done recording your macro, simply tap the Macro key to exit Macro Programming Mode. To playback your macro, simply tap the trigger key or key combination. Choose your switches and pick your accessories.